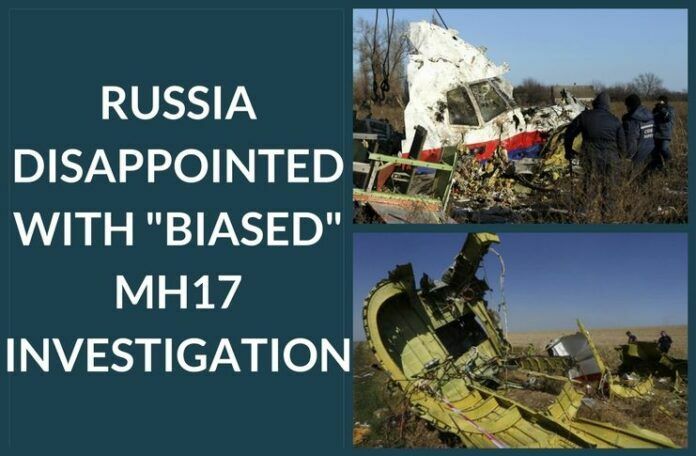 Russia is disappointed with the investigation of the downing of Malaysian Airlines flight MH17, by a Dutch-led team. Russia is disappointed with the investigation of the downing of Malaysian Airlines flight MH17, the Foreign Ministry said Wednesday after a Dutch-led team announced its findings about the ill-fated plane. [dropcap color=”#008040″ boxed=”yes” boxed_radius=”8px” class=”” id=””]”T[/dropcap]he findings of the Dutch Prosecutor’s Office confirm that the investigation is biased and politically motivated,” the ministry’s spokeswoman Maria Zakharova said in a statement. The Boeing 777 crashed in eastern Ukraine on July 17, 2014 while flying from Amsterdam to Kuala Lumpur. All 298 people on board died, most of them Dutch citizens. Earlier on Wednesday, the Joint Investigation Team (JIT), consisting of representatives of the Netherlands, Australia, Malaysia, Belgium and Ukraine, announced that the airplane had been hit by an anti-aircraft Buk missile from the territory controlled by pro-Russian insurgents. The JIT said during an online press conference that it has managed to collect data, including tapped phone calls, pictures and video, proving that the Buk was brought to Ukraine from Russia and then transferred back after the missile launch. [dropcap color=”#008040″ boxed=”yes” boxed_radius=”8px” class=”” id=””]T[/dropcap]he international team added that it had identified around 100 suspects involved in the incident, but it was not ready to make accusations, saying it would be done during the following stages of the investigation. She said Moscow hoped that the JIT would change its opinion after receiving “indisputable evidence” from the Russian side. The JIT said at the press conference that it had not yet received information from Russia, but it was ready to study it, although the team did not believe it would change the investigation results.